Presto Deep Fryer Just $34.84! Down From $100! PLUS FREE Shipping! You are here: Home / Great Deals / Amazon Deals / Presto Deep Fryer Just $34.84! Down From $100! PLUS FREE Shipping! Hop over to Amazon where you can get this Presto Deep Fryer for just $34.84 down from $99.99 PLUS FREE shipping! With the right equipment, deep-fried food can be crisp and delicious instead of fat-logged and soggy. 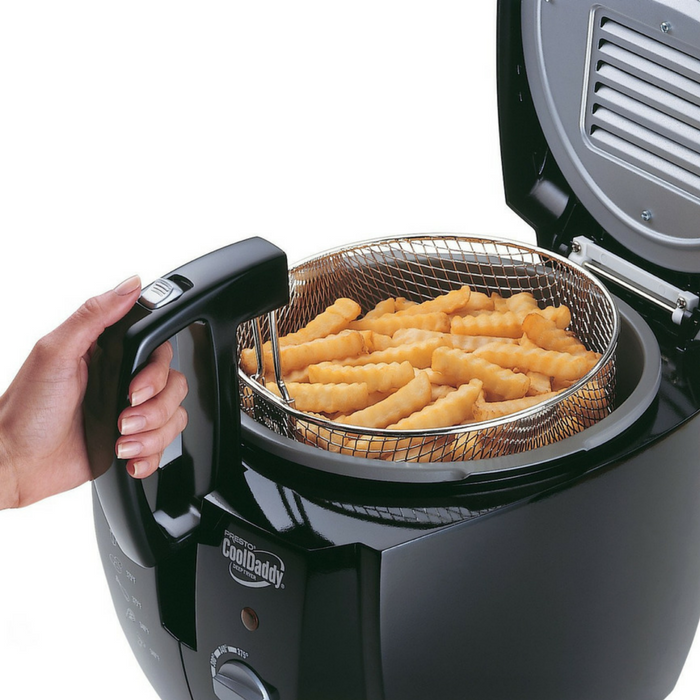 This Presto CoolDaddy electric deep fryer includes several features that help you make tasty fried chicken, fish, shrimp, and French fries for up to six people. Its adjustable thermostat ranges from 250 to 375 degrees F, and its bright red indicator light signals when the oil has reached the desired temperature so food cooks no longer than necessary. A viewing window lets you track progress without opening the cover, and an included wire basket with an exterior handle means you can prevent spatters by lowering food into hot oil with the lid down. Smart in structure, the fryer has a cool-touch exterior and a locking cover with a push-button latch for safety. Perfect for chicken, shrimp, french fries and more. Six-cup food capacity in a compact size. Exterior basket handle lowers food into oil with the cover closed to prevent spattering. Adjustable thermostat for easy selection of the desired frying temperature. Removable air filter absorbs frying odors. Replaces easily. Removable pot for quick and easy cleaning.